Customers often ask why there is a $25 additional fee for the Chinese made Pro Co Rat 2 (technically Rat 3) and how to identify if their model will be subject to this fee. 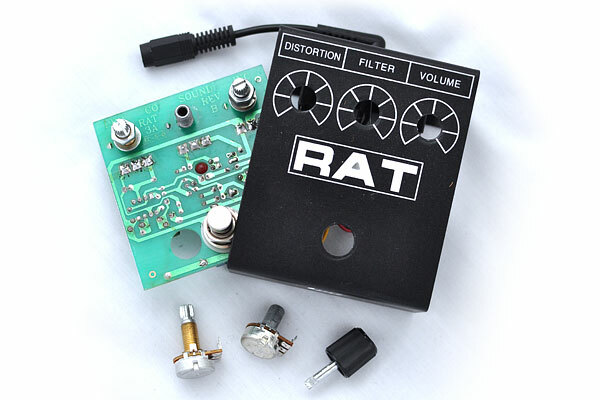 This is an issue that has been come up a few times over the years so I’ll show why the build quality of the new Rat pedals causes us to charge more. Let’s start with the basics: To remove the knobs on most pedals you simply pull the knobs off. When doing this on the newest Rat pedals the entire shaft rips out and the potentiometer then needs to be replaced. If you look above you can see the knob with the shaft stuck in it on the right. The brass-threaded potentiometer on the left is a high quality replacement that we use if the pots are in fact broken in the process. Have smaller, 16mm potentiometers instead of the traditional 24mm. If you aren’t sure please remove the back of your pedal and take a photo of the circuit board before mailing the pedal in. This entry was posted in Gear Related. Bookmark the permalink.